Although Germany’s bigger cities dominate the narrative about dance music’s history in the country, the influence of smaller locales like Mannheim is often overlooked. 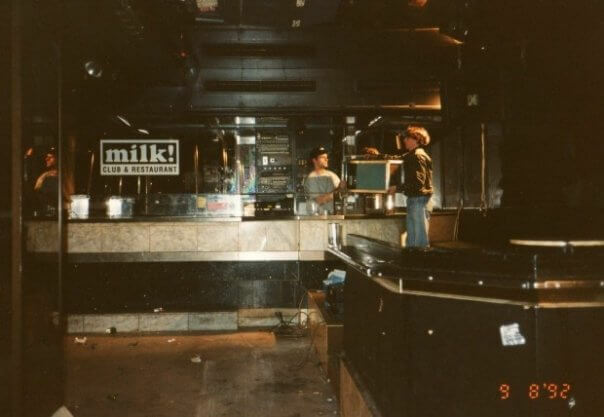 So it goes for the history of breaks-oriented styles in Germany; as four-on-the-floor styles imported from America took hold in the national consciousness in the early ’90s, the club Milk! introduced UK sounds and DJs to German audiences and forming a local scene devoted to styles like jungle and drum ‚n‘ bass. Hard Wax’s Finn Johannsen called one of the main Milk! residents, Holger Klein, to talk about an especially important record for his Rewind column. He picked The Call Is Strong, a Carlton LP produced by downtempo duo Smith & Mighty and released by Pete Tong’s Full Frequency Range Recordings label in 1990—the same year when Milk! opened its doors. What was your first encounter with The Call Is Strong? Alongside Daddy Gee, Carlton was featured on “Any Love”, the very first Massive Attack single, which was a cover of one of my favorite songs from Rufus and Chaka Khan. I was a huge Chaka Khan fan and went to quite a few concerts. The very first time I saw her, I even waited for her at the backstage entrance because I wanted an autograph. Want some trivia? She lived in my hometown, Mannheim, for a few years in the ‘90s. Anyway, back to Carlton: I was really impressed by his crystal-clear falsetto. I think “Any Love” came out roughly around the same time as the first Smith & Mighty singles, so this was the starting point of the Bristol sound. I first heard about the Bristol sound when I read about it in i-D Magazine or The Face. So I already knew about Carlton when his first album dropped. I bought it at the local WOM store where I used to work back then. After you approached me for this interview, I thought that I’d have a hard time choosing “that” record. But then I stumbled across a 12-inch of his song “Cool With Nature”, which contains killer remixes by Bobby Konders, and I remembered how much this album meant to me. When I listened to it for the first time, it blew me away. Smith & Mighty did a fantastic production job. At that time, it was very state of the art to incorporate elements of dub, contemporary US R&B, classic soul, reggae, electronic sounds and even some swingbeat bits. I fell in love with the ethereal and often spliffed-out vibe of the album and Carlton’s songwriting. Carlton’s voice struck me instantly. I think he is a truly underrated singer and it’s a pity that the album wasn’t successful. His voice is really unique, and that must be why Smith & Mighty chose him. It was his album—not a Smith & Mighty project. When you listen to him, you can clearly tell that he’s coming from a reggae background. On The Call Is Strong he sounds like a reggae vocalist singing some kind of otherworldly UK version of R&B. The album takes quite some detours. For example, “Love And Pain” could have been a Two-Tone Records ballad from years earlier, while “Do You Dream” is right on par with breakbeat pioneers like Shut Up And Dance or 4hero. How does The Call Is Strong work as an album? How pioneering was what Smith & Mighty did? It was very pioneering! The sparse beats, their very English way of bringing together the Jamaican sound system culture and US hip-hop without sounding like eager copycats. And of course, as they grew up in England, they must have been in touch with Two-Tone stuff as well when they were teenagers. You’re right: you can also trace down elements that became integral in the breakbeat scene, which was already emerging at a very early stage. I first became aware of Smith & Mighty when they appeared with their Bacharach reworks “Walk On” and “Anyone” two years earlier. The Call Is Strong sounds like a continuation. I thought they sounded like nobody else at that time. Suddenly Bristol was on the map and making a difference. But could anyone predict how big that difference would be? You could clearly hear that Smith & Mighty and Massive Attack were making a difference when their first 12-inches came out. It all sounded so new and fresh. But I really had no idea how big this Bristol thing would become. Also, I had no idea how misinterpreted the whole thing would be when the term “trip-hop” emerged. Of all the groups that emerged in the late ‘80s and were deeply rooted in sound system culture, why were Massive Attack and Soul II Soul so much more successful than Smith & Mighty? Were they less traditional and closer to pop music? And why do you think Carlton didn’t manage to establish himself as an ongoing fixture? Massive Attack and Soul II Soul had the big hit singles, but not by accident. They both had good labels with a staff that knew how to work their releases. Smith & Mighty signed a major deal as well—with Full Frequency Range Recordings, at that time a subsidiary of London Records/PolyGram. The first big project was Carlton’s album, which didn’t prove to be as successful as expected. Then Smith & Mighty were kind of locked into this deal. Under their own name, they only released a four-track EP on FFRR. I would say they missed the right moment due to this deal. It took them years to get out of it. You were one of the resident DJs of Mannheim’s seminal Milk! Club and very active in introducing UK club music to Germany. How important was the sound of Smith & Mighty and likeminded artists to that scene? For my friends and I—for the people who made the club happen—it was very important. For those Milk! regulars who entered later, it probably wasn’t such a defining experience. What made Mannheim so UK-orientated? Mannheim had a legacy of being a big US garrison town. A lot of US soul and funk artists came to town to play live. The roller skating rink that hired a DJ from New York City was legendary in the early ‘80s. So these Anglophile traits are still some kind of mystery to me, even though I have to point to the fact that Milk! also reflected these US influences. At some point, more and more people came to Milk! who were dressed like UK ravers. They didn’t look like the regulars of Sven Väth’s club, Omen, in Frankfurt; Frankfurt is not far away from Mannheim. So we asked ourselves: where do they all come from? Many people who were involved with Milk! from the very beginning came from the local post-punk scene with the Hard Rock Club as its focal point. The Hard Rock was a legendary sweaty basement in Mannheim that closed down in the late ‘80s. Many of us went to London quite often, including myself. But I wasn’t really a part of the post-punk scene; I would rather cite ABC’s “The Lexicon of Love” as one of my biggest influences. Milk! was founded by DJ D-Man in Autumn 1990. He and Gregor “G.O.D.” Dietz, who passed away ten years ago, were the resident DJs of the early incarnation of Milk! club. Gregor used to play acid and house at Hard Rock, and D-Man established a weekly acid house club night in Heidelberg named Planet Bass in 1988. Two years later, the Sheffield bleep sound was very popular at the illegal warehouse parties they hosted in Mannheim. The opening of the Milk! was a big event. The first three months were really exciting, but soon there was a huge drop in popularity for whatever reason. Then I stepped in as a kind of stopgap playing records in a mostly empty club. Nobody expected how big the club would become from late 1991 on. Smith & Mighty were part of every progression of what they originated when they first appeared, be it drum ‘n’ bass, UK garage or dubstep. How relevant were their productions over the years? You can most definitely say that they started something. Their early releases are legend – “Anyone”, “Walk On By” or Fresh 4’s “Wishing On A Star”. All the Carlton singles came with great remixes. One of the biggest things they did is the Rushing Mix of Carlton’s “Do You Dream”. This track is really far out; it’s uptempo with a slightly breakbeatish house beat. Their Steppers Delight EP from early 1992 was a dope proto-jungle record. I would say the Bristol drum ‘n’ bass scene around Roni Size and DJ Krust owed them a lot. Their 1995 album Bass Is Maternal and other releases on their label, More Rockers, combined the original Smith & Mighty approach with a rootsy take on drum ‘n’ bass. Later on, they still did solid records, but I have to say that I wasn’t impressed too much anymore. It was very common that DJs displayed different styles, grooves and tempos in their sets at the time The Call Is Strong was released—and it worked. What happened? Continuous, seamless mixability in one tempo became king. In the ‘80s, DJs played a wide range of styles that included downtempo, midtempo or uptempo R&B, Italo disco, dance mixes of pop records, house, hip-hop, ‘70s funk breaks, electronic body music, new beat, whatever—not necessarily all these genres in one night by the same DJ in the very same club. We all know there were instrumental underground tracks and DJ tools already, but DJs had to drop the big songs as well. When house and later on techno took over, this approach to DJing was lost. Younger DJs were not brought up with this versatility anymore. It all came to a point when the dancers regarded a change of tempo unnatural. The death of this versatility in styles and tempos was the invention of the travelling DJ who was booked to play in different clubs each and every night. It could only work with resident DJs who knew their dancers. Read past Rewind columns with Call Super, DjRUM and more. Cover photo from Milk!’s Facebook page.